Description: William Heinemann for the Trustees of the British War Museum; 1983; Paperback;168 pages including index; b/w illustrated throughout. Condition As new. Mary Ward Books is an independent online bookstore specialising in second hand, out of print books and used books such as Animals In War: Paperback - Valiant Horses, Courageous Dogs, and Other Unsung Animal Heroes by Jilly Cooper. We offer a book search facility and secure payments via PayPal and Nochex. Mary Ward Books is based in East Anglia, United Kingdom. We were established in 1997 and have been selling books online since 2002. 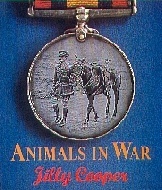 We ship worldwide, please click here to see our shipping charges for Animals In War: Paperback - Valiant Horses, Courageous Dogs, and Other Unsung Animal Heroes by Jilly Cooper. We have many other books in our History- Social & Commercial. section for sale of which below is a selection - Please feel free to browse them or press the 'continue shopping' button below to see the entire History- Social & Commercial. category.